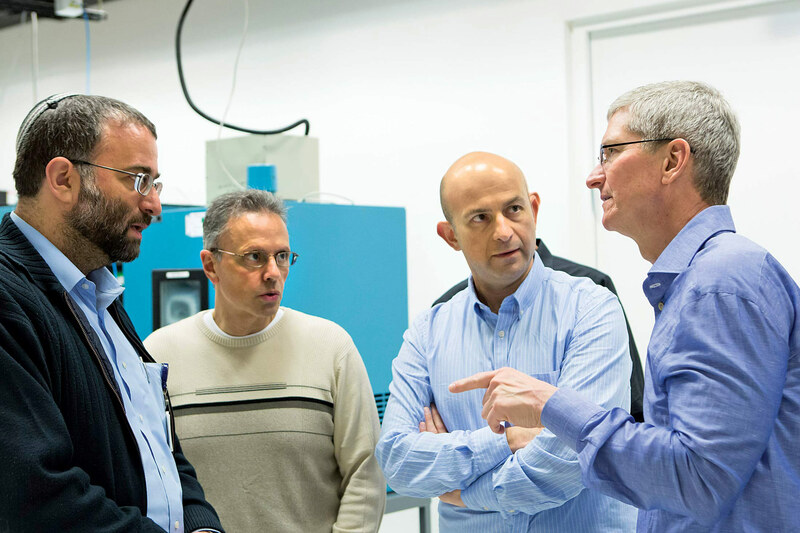 A visit with Cupertino’s chief chipmaker, Johny Srouji. A little over a year ago, Apple had a problem: The iPad Pro was behind schedule. Elements of the hardware, software, and accompanying stylus weren’t going to be ready for a release in the spring. Chief Executive Officer Tim Cook and his top lieutenants had to delay the unveiling until the fall. That gave most of Apple’s engineers more time. It gave a little-known executive named Johny Srouji much less. 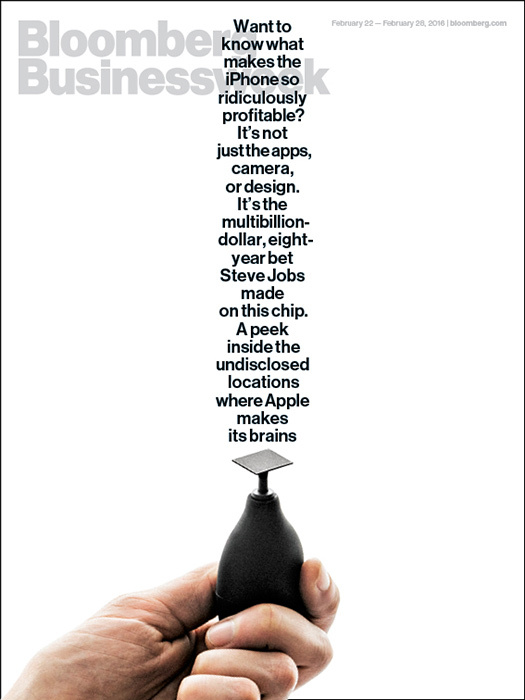 Featured in Bloomberg Businessweek, Feb. 22, 2016.Subscribe now. This is the stuff that keeps technology executives up at night. The iPad Pro was important: It was Apple’s attempt to sell tablets to business customers. And it would look feeble next to the iPhone 6s. So Srouji put his engineers on a crash program to move up the rollout of a new tablet processor, the A9X, by half a year. The engineers finished in time, and the Pro hit the market with the faster chip and a 12.9-inch display packed with 5.6 million pixels. He also stepped into the kind of spotlight he’s avoided since joining Apple in 2008. Srouji runs what is probably the most important and least understood division inside the world’s most profitable company. Since 2010, when his team produced the A4 chip for the original iPad, Apple has immersed itself in the costly and complex science of silicon. It develops specialized microprocessors as a way to distinguish its products from the competition. The Apple-designed circuits allow the company to customize products to perfectly match the features of its software, while tightly controlling the critical trade-off between speed and battery consumption. Among the components on its chip (technically called a “system on a chip,” or SOC) are an image signal processor and a storage controller, which let Apple tailor useful functions for taking and storing photos, such as the rapid-fire “burst mode” introduced with the iPhone 5s. Engineers and designers can work on features like that years in advance without prematurely notifying vendors—especially Samsung, which manufactures many of Apple’s chips. Apple’s usual response is to point to Jony Ive and his team of fastidiously cool, Wallabee-shod industrial designers, or to highlight elegantly tooled aluminum or an app or some new feature or gadget. There’s always something new to show off. But none of that has ever explained anything about a crucial part of Apple’s profit machine: its chips. In Israel, Srouji (second from left) and Cook (right) with Apple employees. One of Jobs’s trusted advisers, Bob Mansfield, Apple’s top hardware executive at the time, recruited Srouji to lead that effort. Srouji, then at IBM, was a rising star in the arcane world of semiconductor engineering. Mansfield promised him an opportunity to build something from scratch. The decision to design semiconductors was risky. About the size of a small postage stamp, the microprocessor is the most important component of any computing device. It does the work that makes playing games, posting to Facebook, sending texts, and taking pictures seem easy. Small currents of energy move from the battery through hundreds of millions of tiny transistors, triggering commands and responses in nanoseconds. It’s like an intricate city design that fits on the tip of your finger. When the chip isn’t doing its job efficiently, the device feels sluggish, crashes, or makes users want to throw it against a wall. When Srouji joined Apple, the company had a group of about 40 engineers working on integrating chips from various vendors into the iPhone. That grew by about 150 people in April 2008, after Apple acquired a Silicon Valley chip startup called P.A. Semi, which had a power-efficient semiconductor design. Srouji’s team found itself interacting regularly with other departments, from software programmers, who wanted chip support for new features, to Ive’s industrial designers, who wanted help making the phones flatter and sleeker. An engineer who sat in on Srouji’s meetings remembers senior managers preparing extensively for presentations, because his support was critical for getting new features approved. He was known for peppering engineers with technically sophisticated questions, particularly about contingency options if something didn’t work out as planned. He’d ask, for example, if a different form of plastic could be used that wouldn’t interfere with another component. The first public signs of Srouji’s work came in 2010 with the debut of the iPad and iPhone 4. The processor, the A4, was a modified version of a design from ARM Holdings, a British company that licenses mobile technology. The A4 was designed to power the handset’s new high-definition “retina display.” Srouji says it was a race to get that first system-on-a-chip produced. “The airplane was taking off, and I was building the runway just in time,” he says. Over the next few years, Apple kept making improvements to its designs, introducing chips to accommodate fingerprint identification, video calling, and Siri, the iPhone’s voice-activated assistant, among other enhancements. When the companies using Google’s Android operating system started making tablets, they mostly used conventional mobile phone processors. Starting with the third-generation iPad in 2012, Srouji’s team designed specific chips (the A5x and A6x) to give the tablet the same pixel-packing high-definition screens as the iPhone. 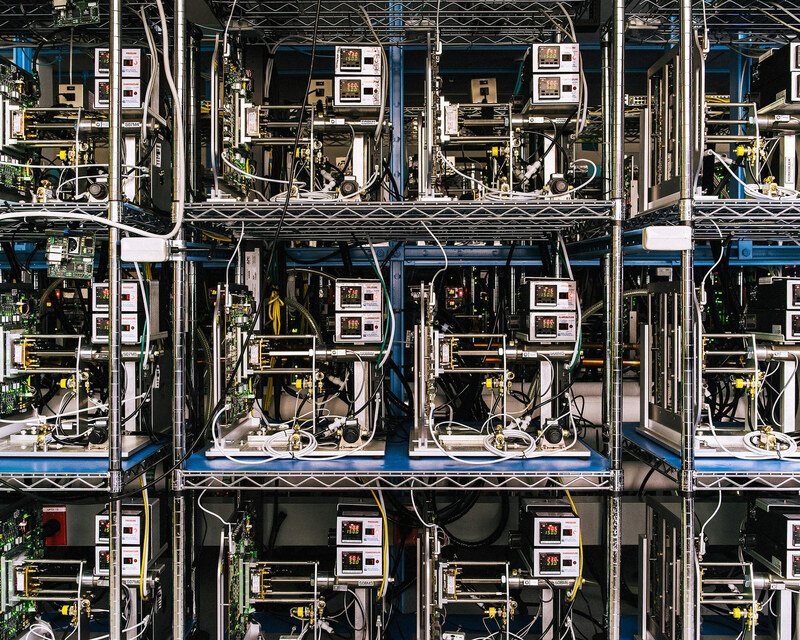 Chip-durability testing at an unmarked Apple lab in Cupertino. Srouji’s father owned a metal pattern-making business outside the city, and from age 10, Srouji spent weekends and summers helping him pattern wooden moldings that were used to make engine parts, medical equipment, and other machinery. His father had an unusual philosophy: He would undercharge customers for complicated work while overcharging for easier jobs. “If there was a very complex thing that he’d never done, he wanted to do it,” Srouji says. His father, who died in 2000, constantly reminded him not to get comfortable in the family business. Education was more important. In high school, Srouji got perfect grades in math, physics, chemistry, and science. He was introduced to computers by an instructor who also taught at the nearby Technion Israel Institute of Technology, one of the world’s top engineering schools. “I fell in love,” Srouji says. After graduating, Srouji got a job with IBM, which had placed its largest non-U.S. research facility in Haifa, the better to attract the big brains coming out of the Technion and other Israeli universities. He researched distributed systems, an emerging field in which computers in different locations are networked together to complete computationally intensive assignments. Ensuring the machines communicated correctly required skill building hardware and writing software algorithms. In 1993, Srouji left IBM for Intel, where he created techniques for running simulations that test the strength of semiconductor designs. During a visit to the U.S. in 1999, he used a 20-minute car ride with a manager, fellow Israeli Uri Weiser, to lobby for a three-year stint at Intel’s research hub in Austin. Assuming Srouji was also Jewish, Weiser invited him to an Israeli Memorial Day celebration at a synagogue in Texas. Srouji lives a few miles from Apple’s headquarters at One Infinite Loop, Cupertino. He drives a black Mercedes-Benz and relaxes by lifting weights and riding his bike on weekends. He smiles easily, warmly touches a reporter’s shoulder when sharing a laugh, blushes at compliments, and absolutely clams up when he’s asked about anything that could remotely be considered a corporate secret. “I don’t want to go into too much detail on that” is a common refrain. One morning in February, Srouji conducts a brief tour of his domain, which is scattered in unmarked locations around Silicon Valley. A shuttle bus leaves One Infinite Loop and drives 10 minutes through a series of residential neighborhoods to a low-rise office building near the Santa Clara city limits. In an adjacent room, circuit boards are wired together in milk carton-size stacks to simulate the capabilities of a future iPhone or iPad. Apple’s software programmers, sitting anywhere in the world, can remotely test how their code holds up against a future chip design. Then the shuttle takes Srouji a few more miles away, to another unmarked building, where rows of customized Mac Minis are testing prototype chips under various temperature and pressure conditions. Standing in an aisle, surrounded by exposed circuit boards and digital innards, is like being inside the Matrix. “No one has seen this before,” Srouji says. Apple isn’t completely in charge of its own destiny. It remains in many ways a prisoner of its supply chain. Displays come from Samsung, and cellular modems from Qualcomm. Samsung and TSMC, based in Taiwan, still manufacture the processors. Apple’s ability to keep up with demand is in part dependent on the production capacity of those companies. It also lags behind Samsung in some areas of chip development, such as adding a modem to the central processor to conserve space and power and transitioning from a 20-nanometer chip design to a more compact 16-nanometer format, which means even more transistors can be crammed into a smaller space. “If I was just arguing hardware and not Apple’s marketing, I would say Samsung has the best processor,” says Mike Demler, a senior mobile chips analyst at the Linley Group, a technology consulting firm in Silicon Valley. Or Apple could just be getting started. It relies on suppliers for Wi-Fi modems now, but will it forever? “I don’t want to go into Wi-Fi specifically,” Srouji says. Apple could also take a page from Tesla’s playbook and start developing its own batteries. “I don’t want to get into batteries too deeply,” he says.